Flip a coin. 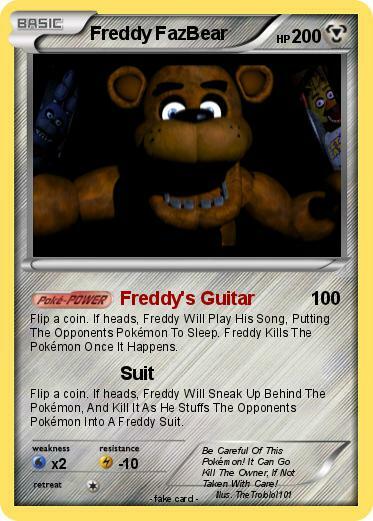 If heads, Freddy Will Play His Song, Putting The Opponents Pokémon To Sleep. Freddy Kills The Pokémon Once It Happens. Flip a coin. If heads, Freddy Will Sneak Up Behind The Pokémon, And Kill It As He Stuffs The Opponents Pokémon Into A Freddy Suit. Comments : Be Careful Of This Pokémon! It Can Go Kill The Owner, If Not Taken With Care!